Cast out of Eden and separated from the boy she dared to love, Allie will follow the call of blood to save her creator, Kanin, from the psychotic vampire Sarren. But when the trail leads to Allie’s birthplace in New Covington, what Allie finds there will change the world forever — and possibly end human and vampire existence. Allie thought that immortality was forever. 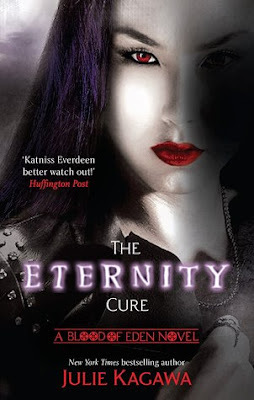 But now, with eternity itself hanging in the balance, the lines between human and monster will blur even further, and Allie must choose between the mortal world and her immortality. Blood calls to blood. That’s how Allie knows she’s on the right path in looking for her maker Kanin, who was forcibly taken by an ancient, psychotic and powerful vampire named Sarren. 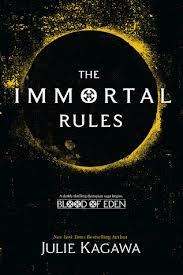 But another blood calls to her, that of her vampire brother’s, Jackal, the one who destroyed many of those she cared about before they found Eden (The Immortal Rules: Blood of Eden Book 1). Desperate to find Kanin, she and Jackal form an uneasy alliance, to last only until they find their maker and stop Sarren from releasing the red lung virus on the remaining humans. What she didn’t expect to find on her search was Zeke, the human she left behind in Eden despite the fact that she loved him. Zeke left assured safety for the unknown for one purpose only: to find Allie and bring her back with him. Zeke goes where Allie goes, even in the company of Jackal, whom he despises and blames for the death of his kin. When they reach New Covington, Allie’s former home, they find crazed humans more dead than alive. The virus has been released and Kanin is near death. They have to confront Sarren for the cure before it’s too late. But what if the cure does not exist? What if their world is finally at its end? 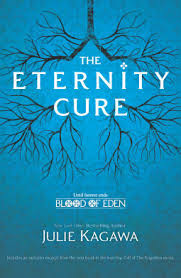 The Eternity Cure begin months after the end of Book 1, and upon reading the first few words, I was hooked. The pace is perfect with twists and turns that kept me up all night. Julie Kagawa is a consummate storyteller. Her words on those pages play like a movie in my head, I can actually imagine scenes playing out as I read her books. That's how good she is... Books filled with imagination, suspense, adventure and love. If you are a huge fan of Julie Kagawa’s The Iron Fey series (Me! Me!) DO NOT expect this to be at all similar to it. This is a total departure from the Iron Fey. It is much more violent, gory... Bloody. But still with as much heart and romance you'd keep coming back to. To say that Kagawa is good is not enough. To want more from her is to be expected. If based alone on the books she has churned out so far, we can already be guaranteed a lot more thrilling rides in the different worlds created by her. 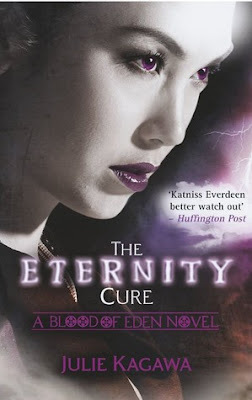 There is only one more book in The Blood of Eden series and I cannot wait to find out more about the mystery that is Kanin. Also beware of the cliffhanger. The end might just make you scream. That said, I can only hope and wait for more of The Iron Fey, for although Allie Sekemoto and Zeke Crosse are great characters, there's none I love more than Meghan, Ash and Puck.